A study in mice has shown how problems in brain development that occur before birth can lead to social impairments and repetitive behaviors similar to those in people with autism. 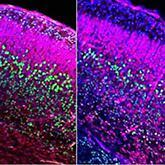 Overgrowth of neurons during a particular stage of prenatal brain development can lead to impairment in social interactions later in life, according to an animal study reported February 2, 2016 in the journal Molecular Psychiatry. The research tied the neural overgrowth to a specific cell signaling pathway—a finding that may help explain some of the brain development abnormalities involved in autism. NARSAD 2014 Young Investigator Ramon Y. Birnbaum, Ph.D., of Ben-Gurion University of the Negev in Israel, and 1999 and 2002 NARSAD Young Investigator Robert McEvilly, Ph.D., at the University of California San Diego, were members of the team that conducted the research, which was led by Anthony Wynshaw-Boris, M.D., Ph.D., of Case Western Reserve University School of Medicine. To investigate biological processes that underlie social behavior, the team studied mice with mutations in genes called Disheveled 1 and Disheveled 3. Mice with these mutations, which affect important players in a signaling pathway called Wnt that controls many aspects of brain development, exhibit repetitive behaviors and abnormal social interactions, such as reluctance to interact with unfamiliar mice. These behaviors are analogous to those seen in people with autism spectrum disorder. No one previously had found brain defects in these adult mice that explained their behavior, but Dr. Wynshaw-Boris and his colleagues wondered whether the problems might be traced to abnormalities that happen before birth. So they followed how the brain developed in mice with the Disheveled gene mutations, comparing the process to brain development in mice without the mutations. Although they found that both sets of animals' brains were of normal size throughout most of their development, the scientists discovered a brief developmental period during which the brains of animals with Disheveled mutations were larger than those of embryos that lacked the mutations. Further analysis showed that at this stage, Disheveled mutations cause precursor cells that give rise to neurons to divide and mature unusually fast. This resulted in too many neurons being added to the brain. The researchers were able reverse these effects—and prevent later behavioral abnormalities—by temporarily activating the Wnt signaling pathway during the critical period. Further research is needed to determine whether similar molecular mechanisms underlie the problems with social interactions that are associated with autism.